The Journey Hostel, Santa Marta, Kolumbia : Rezerwuj teraz! Come take a Journey with us! The Journey Hostel is located 1 km from the entrance of Parque Tayrona. Our location is perfect for those who want to take a day trip to Parque Tayrona, then come back to family style meals, cold drinks, showers and comfy beds. At Journey, a breakfast of granola or cereal is included with your stay and served from 7:30-9:30am, for those who want to get an early start! While you’re here, you can walk our famous Monkey Trail. This is a 40 minute circuit trail through the river, jungle and beach. 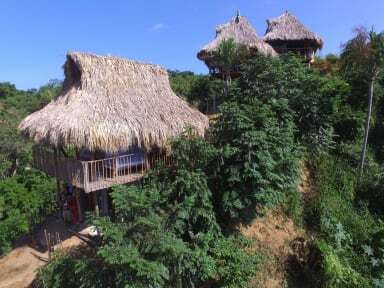 We offer accommodations our private cabins or in our 10 bed dormitory. Rooms are built into the foothills of the mystical Sierra Nevada, so your view is overlooking beautiful Parque Tayrona. The rooms are all open design, with mosquito nets and hammocks. All of the rooms are equipped with lockers and outlets. We are not finished just yet! We are still in development and construction to expand our hostel so we can host many more people! We offer free filtered drinking water, so our guests can stay hydrated for any adventure in our incredible coastal nature. We have an on-site tienda and bar, along with home cooked meals at a reasonable price. Please note: upon arrival, each guest will be automatically signed up for dinner/s (served each night at 19:00). We can accommodate vegetarians! If the guest does not wish to have dinner, it is their responsibility to advise us. Please also note that you’ll be meeting our adorable dogs and cats during your stay. We take Debit, MasterCard, Maestro and Visa. Pleased be advised there is a 6% charge when paying with card. For travellers coming from big cities - keep in mind when coming to the coast, there is very little access to ATMs.